On the other end of the Nishi-Seto Expressway are the Onomichi and Shin-Onomichi Bridges. They cross the Onomichi-Suido Strait and connect Honshu to Mukaishima Island. The Onomichi Bridge (on the right) was built in 1968 and was the first modern cable-stayed bridge in Japan. Ownership transfered to the Honshu Shikoku Expressway in 1988. Because the Onomichi Bridge had only two lanes, the new Shin-Onomichi Bridge was begun in 1993 and completed in 1999. It has two single-legged towers and it was designed not to disturb the aerodynamic stability of the older bridge. Cranes were positioned at the ends of the deck farthest from each tower to lift the steel box girder segments into place. Both bridges are strange mixtures of reinforced concrete and structural steel. The older bridge is completely steel except for the bottom of the towers. 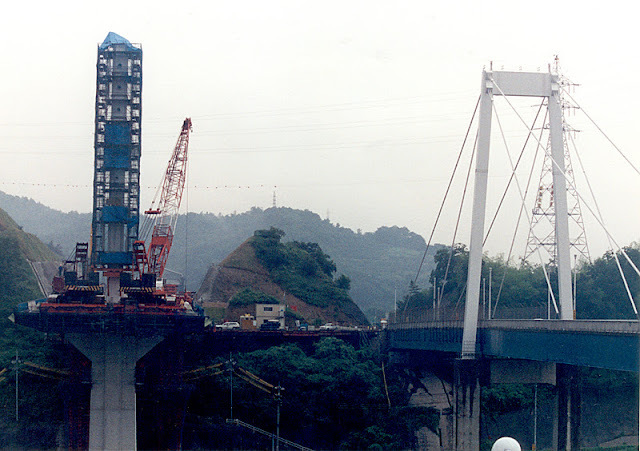 The new bridge has a steel superstructure supported by reinforced concrete towers. Honshu-Shikoku Bridges: Shin-Onomichi Bridges by Mark Yashinsky is licensed under a Creative Commons Attribution-NonCommercial-ShareAlike 3.0 United States License.